Not only non-vegetarians (Chicken, Mutton, Prawn etc.) 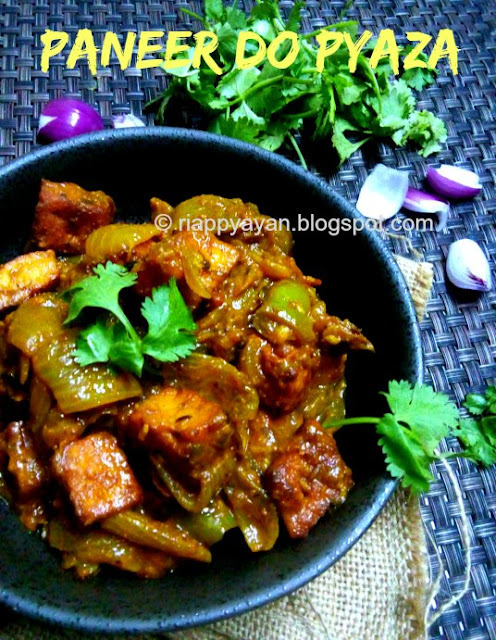 even Vegetarians (Paneer, Bhindi, Mushroom) way also this dish can be made. 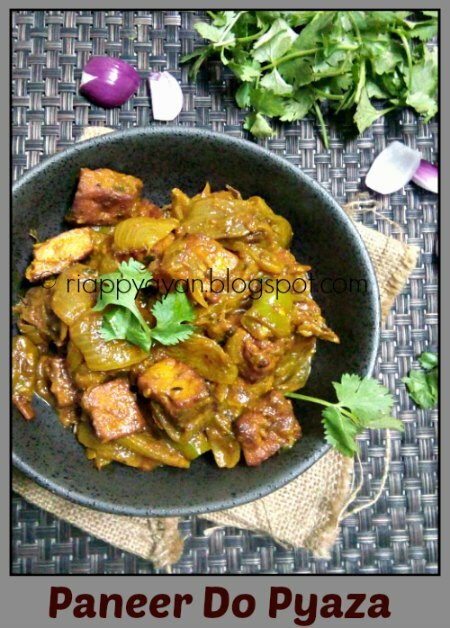 In this recipe, some amount of onions are cut in larger size, pan sauted till brown and used for garnishing the dish. And another set of finely chopped onions are used for making the curry....this way double the amount of onions are used in this recipe. Very less spices are used and succulent paneer pieces are dunked into a onion-tomato based gravy flavoured slightly with kasuri methi (dried fenugreek leaves) and lastly sauted onions are added into the curry to give the curry a crunchiness. Take a large onion and cut into 4, then separate the layers and set aside. Take the other onion and slice thinly. Heat 1 tblsp. oil in a pan, saute the cubed onion slices till they are transparent but did not change its color. Remove on a kitchen towel and set aside. In the same oil, saute the paneer pieces till they are slightly brown. Remove. In the ame oil, temper with cumin seeds and slitted green chillies. Immediately, add sliced onions and capsicum pieces. Saute till they are transparent, then add giner-garlic paste and chopped tomatoes. Saute for 2-3 minutes or tomatoes are soft. Add spice powders one by one and mix in the pan. Add 2-3 tblsp. water in it and cook for 2-3 minutes or oil seperates. Add sauted paneer and sauted onion cubes in the pan, mix, season with salt and kasuri methi. Add about 2/3 cup water and in medium flame cover the lid and let it cook. Remove from heat when water almost evaporated and the gravy has nicely coated the paneer pieces. Lastly garnish with chopped coriander leaves. 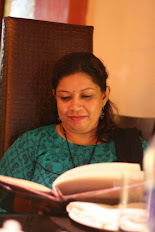 It goes very well with roti/chapathi, naan, Paratha or any kind of Indian flatbreads. I have posted lots of Paneer preperation here. You can check them all here.